Solicitor General, Kim Kyte and Attorney General, Basil Williams. 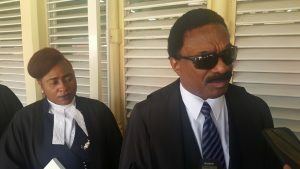 Attorney General and Minister of Legal Affairs, Basil Williams on Thursday slammed the Caribbean Court of Justice- Guyana’s final appeal court- for striking out a request by the State to hear an appeal although the stipulated deadline had passed. CCJ President, Justice Dennis Byron has dismissed the request to hear an appeal against the Trinidad-based company, DIPCON Engineering, and has awarded costs to the company amounting to US$2.5 million. However, Williams said Guyana’s new Civil Procedure Rules permit the granting of leave beyond the deadline for an appeal to be heard in special circumstances. “The Court is concerned about the interest of justice. The overriding objective in such cases under the new rules is to determine the issues between the parties and so that no technicalities is to try to determine the issues between the two parties and so no technicality ought to come between the court and the litigants to prevent the court from going to the real subject matter,” he told reporters. The Attorney General said the APNU+AFC coalition inherited the case involving DIPCON from the previous PPP-C government, and he attributed the delay to no notice having been given to the government until the period allotted under the rules had expired. Again, he contended that there was no evidence of the file in the Attorney General’s Chambers about the case involving GYD$400 million. He said he has established a precedent in Guyana’s Court of Appeal to apply for an extension of time to file an appeal out of time. “That clearly shows the procedure that if the Court of Appeal knocks you down here, you go back to the Court of Appeal for special leave to appeal to the CCJ… I’m confused that the CCJ- the highest level- would not recognise that this is a matter in the public interest, this is a case involving funds from the IDB (Inter-American Development Bank) and a claim that these people were entitled to these funds but these funds could only be made payable with the consent of the IDB,” he said. The Attorney General said DIPCON was not entitled to the monies because additions to the contract could not have been approved because it was for a fixed term. Meanwhile the Attorney General said the Guyana Police Force’s Special Organised Crime Unit would be probing the situation with those cases in which lawyers who were hired to argue for the State ended up arguing for the company.